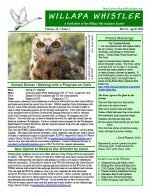 The March - April 2010 Whistler is available now. Long-toed Salamanders gather at breeding sites and lay their eggs. Sudden, prolonged, sub-freezing weather can kill both adults and eggs. The first Red-legged Frogs lay their eggs. The low croaking of Pacific Treefrogs can be heard away from the ponds, but they are not yet breeding. The first Northwestern Salamanders lay their eggs. The last Long-toed Salamanders lay their eggs, and many of the earlier eggs hatch. The last Red-legged frogs lay their eggs. Pacific Treefrogs begin chorusing and may begin to lay eggs. It looks like we may be in early spring. This sure describes what we're seeing out there in Cowlitz and Wahkiakum counties. Looks like chorus frog eggs have been found in Clark County. Do you like Backyard Birding? The WHAS Board of Directors is developing a new ad hoc committee on Backyard Birding. This is an exciting opportunity to promote an activity that includes more than 65 million people in the U.S, according to the Fish and Wildlife Service. Many WHAS members have much knowledge and experience that they can share. Who knows where it will lead? That will be the first subject that the committee will address. There are so many possible topics from which to choose, including education on plantings and habitats, back yard bird counts, certification, techniques on feeding and watering, and sharing of ideas. Andrew Emlen of Skomokawa observed a fascinating behavior last December. Here are the details as described by Andrew: A female Northern Harrier landed on a duck (possibly a wigeon, of which there were others nearby) in the pond opposite Hornstra Beach in the Julia Butler Hansen Refuge. The Harrier was belly-deep in the water as the duck struggled. For the Leadbetter Point Christmas Bird Count (CBC), on December 19, 2009, we noted 91 species, including one species new and another species with the highest number during our 35+ years of doing the Count. Number of individuals: 29,508. Temps: low 38F, high 54F. Winds: 0 to 10 mph. Cloud cover 90% to 100%, light rain or mist at nearly all times, 95% of day, 0.5 inches total. Low fog hampered views of water birds, and shortened visibility significantly. At least the wind wasn't blowing! Many very low counts or groups of species missing which are noted nearly every year: scoters, loons, grebes, cormorants, finches. Recent studies have revealed a special survival mechanism for a bird living on the east coast of the US. Now it's called the world's most promiscuous bird. 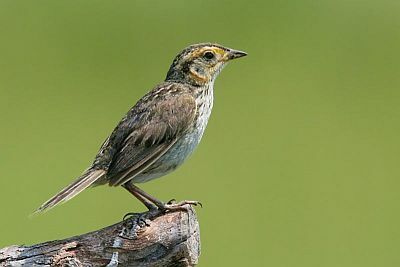 The saltmarsh sparrow, that lives in the marshes of Connecticut, was found to have high levels of multiple mating. 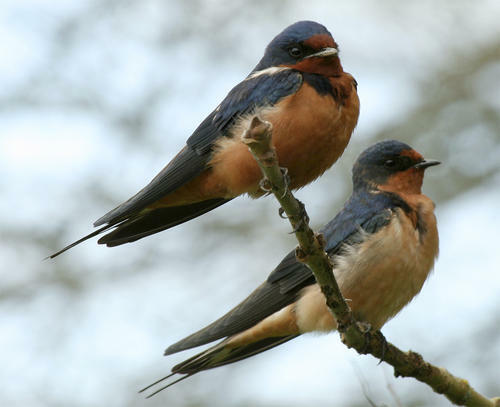 The scientists found that 95% of females mated with more than one male during each nesting period. They assume that this unusual behaviour could be a survival mechanism due to coastal flooding. Using DNA analysis and studying the birds mating behaviour in the marsh habitat, the researchers revealed the highly promiscuous activities of the bird. The results were published in the journal The Auk. Check out this BBC website for more information. On December 29, 2009, 21 volunteers participated in the twelfth annual Wahkiakum Christmas Bird Count. Though the temperature rose into the low 40's from the morning's freezing temperatures, a cold east wind blowing over 20 mph in many parts of the circle made it hard to find birds. Some afternoon rain and snow didn't help either. The count of 104 species is three below our average. Two species were new to the Wahkiakum CBC. Eurasian Collared-Doves are now well- established on Puget Island, where 10 were found on count day. 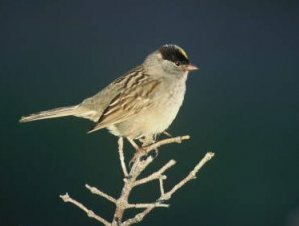 An Empidonax sp. flycatcher was found near the east end of East Birnie Slough Road, Puget Island. I attempted to relocate it, but did not succeed. Listen to an interview with the Christmas Bird Count and Feeder Watch coordinators on NPR's Science Friday from 2009 here and from 2008 here and continuing here with a discussion of the benefits of shade grown coffee. The 2009 interview in particular talks about the northward movement of birds as documented by the counts.